First of all, you should ask yourself the question: Where do I want to attach my hanging chair? In the house or in the garden? Outdoors in the summer and indoors during the winter? Or maybe on the covered porch or balcony? 1 A Stand or a Suspension Kit? 2 How to hang a Hanging Chair from the Ceiling? A Stand or a Suspension Kit? In general, the more flexible you want to use your hammock chair, the more worth is to purchase a hanging chair stand. So you are on the safe side and can use your hanging chair set where ever you want. If you want to use a hanging chair slightly less flexible (for example, indoors in winter and in summer in the garden), there are very suitable suspension systems. With these systems, you can attach the hanging chair not only to a ceiling but also on a stable branch of a tree in your garden in the summer. How to hang a Hanging Chair from the Ceiling? There are two ways to hang your hammock chair: Swing Style and Pivot Style. Swing Style: If you decide to hang your hammock chair “Swing Style”, you can use it as a comfy swing which allows you to sway forth and back. 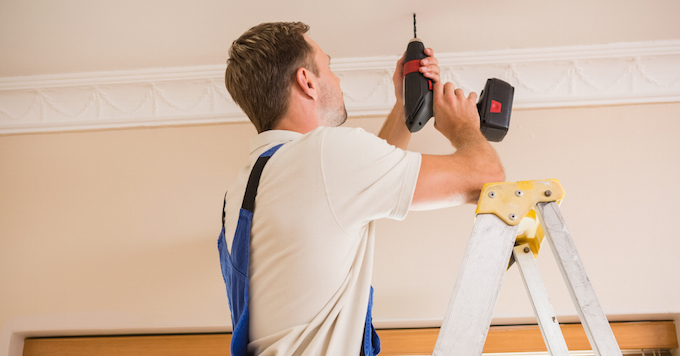 In this case, you will need two anchor points in your ceiling indoors or a single sturdy tree branch in your backyard. You have here two options- to hang it with or without a spread bar. 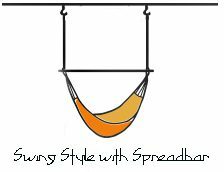 If you want to hang your hammock chair in a smaller area we recommend to hang it swing style with a spread bar. In this case, the optimal span between two anchor points is smaller than without a spread bar. 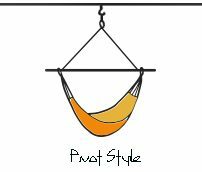 Pivot Style: Hanging your hammock chair “Pivot Style” allows you to rotate 360 degrees and drift smoothly while you relax. If you prefer this hanging style, you will need only one anchor point. Usually, almost all kinds of hanging basket chairs use this hanging technique being suspended from the one anchor point with a chain or rope. The high-quality MARATHON swing hanger is a perfect choice to hang your hammock chair “swing style” with two suspension points on our porch or your living room. Outdoors: If you want to hang your hanging chair outdoors, a tree branch or an overhead beam on your porch could be a good choice. In this case “Wrap Ropes” technique over your tree branch or around the beam on your porch is the best. Indoors: The other one, “Drill Hooks” technique, is used for hanging the chair indoors. As you see, there are some excellent suspension sets which are totally secure and very easy to install and with each of these products your chair is easy to hang or remove. But please note – no matter which of these sets and what kind of hanging chair you to decide to use, for detailed information about installation and safety always follow enclosed manufacturer’s instructions for use.